” This position paper outlines the Productivity Commission’s early thinking on NDIS costs. The purpose of this position paper is to seek feedback on the Commission’s preliminary conclusions, and on any additional issues that should be considered before the public release of the final study report. 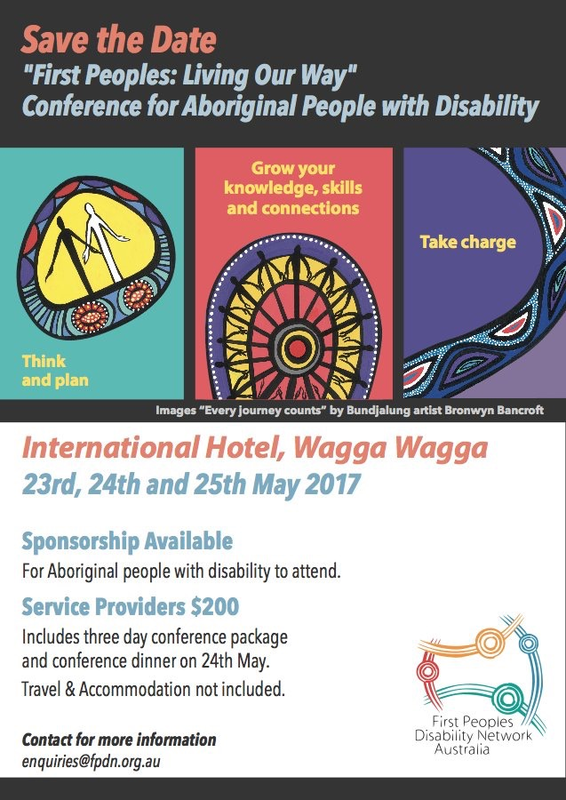 ” For Aboriginal and/or Torres Strait Islander people living with disability and their carers, this is a much-needed conversation. ” For many, language barriers can prevent meaningful engagement with planning processes. Neami National (sub. 63, p. 6) said that ‘consumers without English as their first language describe difficulties in participating in planning and in getting plans that they can fully implement on account of their language needs’. This is an issue which disproportionately affects Aboriginal and Torres Strait Islander communities: English is a second language for many Indigenous people in remote communities. The majority of participants in Barkly identify as being Aboriginal or Torres Strait Islander and for 67% English is not their first language. Many have limited capacity to understand or read it. In 2020, when the NDIS is fully rolled out, around 475 000 people with disability are expected to receive individualised supports, at an estimated cost of $22 billion per year. In a position paper released today, the Commission finds that while it is early days in the transition to full scheme, the NDIS is on track in terms of costs. 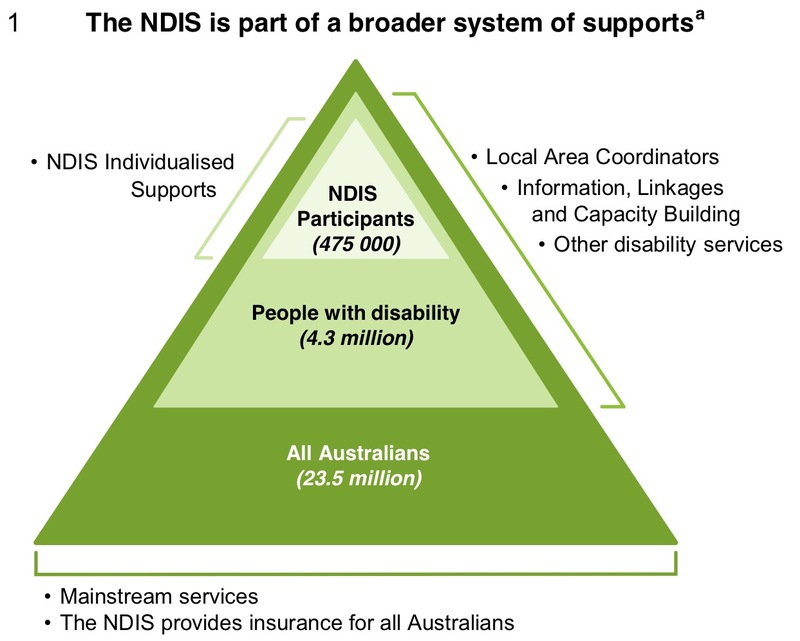 The National Disability Insurance Scheme (NDIS) is a complex and highly valued national reform. The scale, pace and nature of the changes it is driving are unprecedented in Australia. If implemented well, it will substantially improve the wellbeing of people with disability and Australians more generally. The level of commitment to the success and sustainability of the NDIS is extraordinary. This is important because ‘making it work’ is not only the responsibility of the National Disability Insurance Agency (NDIA), but also that of governments, participants, families and carers, providers, and the community. Based on trial and transition data, NDIS costs are broadly on track with the NDIA’s long-term modelling. While there are some emerging cost pressures (such as higher numbers of children entering the scheme), the NDIA has put in place initiatives to address them. The benefits of the NDIS are also becoming apparent. 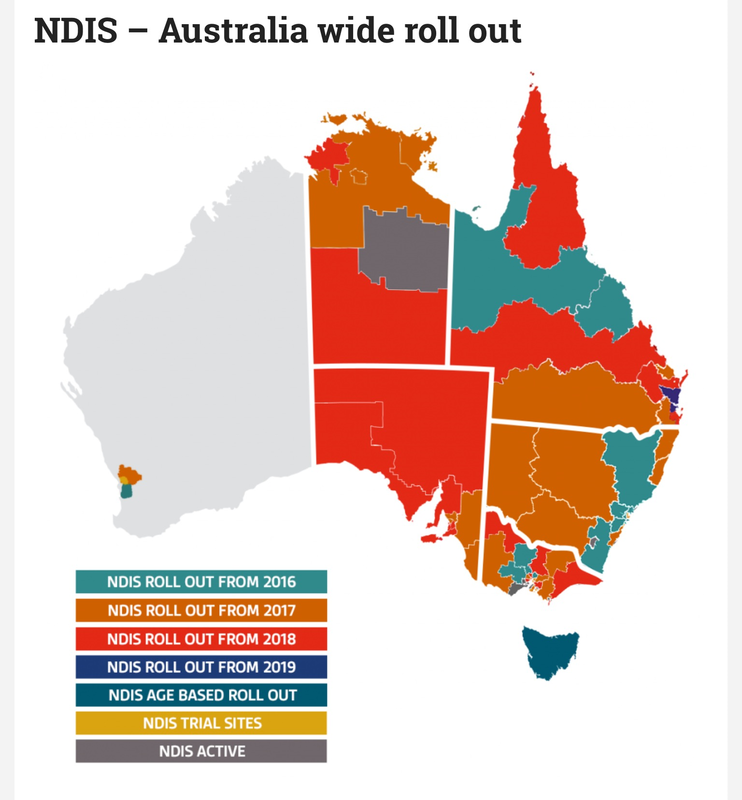 Early evidence suggests that many (but not all) NDIS participants are receiving more disability supports than previously, and they have more choice and control. Nevertheless, the speed of the NDIS rollout, as specified in Bilateral Agreements between governments, has put the scheme’s success and financial sustainability at risk. It has resulted in the NDIA focusing too much on meeting participant intake estimates and not enough on planning processes, supporting infrastructure and market development. This focus is manifest in poor outcomes such as confusion for many participants about planning processes; rushed phone planning conversations; inadequate pre-planning support for participants; problems for providers with registering, pricing and receiving payment; and a lack of effective communication with both participants and providers. For the scheme to achieve its objectives, the NDIA must find a better balance between participant intake, the quality of plans, participant outcomes, and financial sustainability. Steps are now being taken by the NDIA to better balance these aspects. Greater emphasis is needed on pre-planning, in-depth planning conversations, plan quality reporting, and more specialised training for planners. The Commission is unable to form a judgment on whether such a refocus can be achieved while also meeting the rollout timetable. 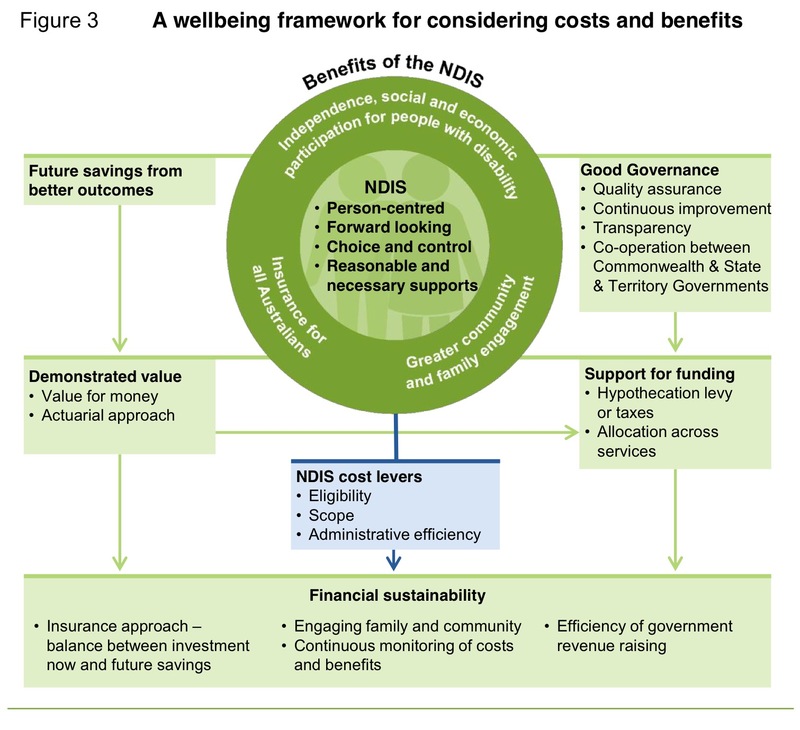 The interface between the NDIS and other disability and mainstream services is also critical for participant outcomes and the financial sustainability of the scheme. Some disability supports are not being provided because of unclear boundaries about the responsibilities of the different levels of government. Governments must set clearer boundaries at the operational level around ‘who supplies what’ to people with disability, and only withdraw when continuity of service is assured. A significant challenge is growing the disability care workforce required to deliver the scheme — it is estimated that 1 in 5 new jobs created in Australia over the next few years will need to be in the disability care sector. Present policy settings are unlikely to see enough providers and workers as the scheme rolls out. Some emerging shortages need to be mitigated by better price monitoring and regulation; better tailored responses to thin markets; formal and informal carers allowed to provide more paid care; and a targeted approach to skilled migration. NDIS funding arrangements could better reflect the insurance principles of the scheme, including by allowing more flexibility around the NDIA’s operational budget and providing a pool of reserves. Funding contributions made ‘in-kind’ must be phased out. ‘While there are some emerging cost pressures, such as higher than expected numbers of children entering the scheme, the National Disability Insurance Agency (NDIA) has put in place initiatives to address these cost pressures,’ Commissioner Angela MacRae said. ‘Given the extraordinary scale, pace and nature of the changes the scheme is driving, we are seeing some big challenges. A key concern is the speed of the rollout and its impact on the experience of participants and providers through the planning process, plan quality and market development,’ Mr Spencer said. ‘A real challenge is growing the disability care workforce needed to deliver the scheme. As many as one in five new jobs created in Australia over the next few years will need to be in the disability sector. There are unlikely to be enough providers and workers as the scheme rolls out under current policy settings,’ Mrs MacRae said. The paper finds that the NDIA must place greater emphasis on pre-planning, in-depth planning conversations, plan quality reporting, and more specialised training for planners. And governments must set clearer boundaries around who supplies what, so that people with a disability are assured of continuity of service. ‘Everyone wants the NDIS to work, but there are challenges to be overcome and work is needed by all governments. Putting the enormous goodwill behind the NDIS into action is needed now more than ever,’ Mr Spencer said. 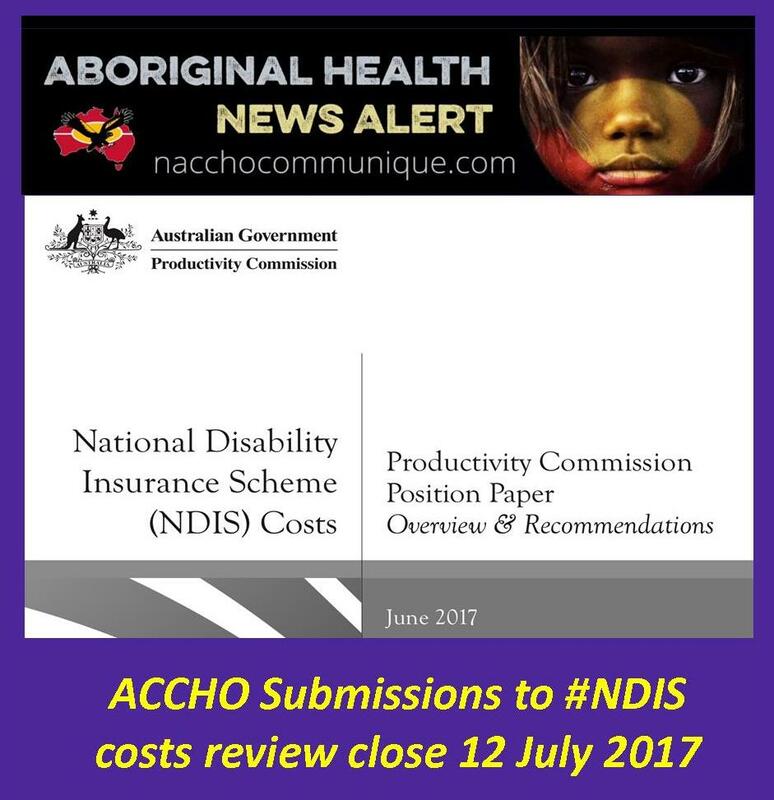 The Productivity Commission’s position paper is National Disability Insurance Scheme (NDIS) Costs . On 2 May 2017 the first of the Redfern Statement alliance workshops was held on the land of the Gadigal People of the Eora Nation. We were welcomed to Gadigal land by Ms Yvonne Weldon. We acknowledged the traditional owners of the Gadigal lands, and paid our respects to Elders past and present. The Redfern Statement workshop was hosted by the First Peoples Disability Network (FPDN), the peak organisation of and for Aboriginal and Torres Strait Islander people with disability, in collaboration with The National Congress of Australia’s First Peoples. Community Elders and representatives from First Nations and Disability peak organisations participated, including representatives of First Peoples community controlled health, justice, housing, family violence, and community service organisations, alongside representatives from the Department of the Prime Minister and Cabinet and the Department of Social Services and other key government agencies involved in setting Australian government disability policy. Senator the Hon. Nigel Scullion, Minister for Indigenous Affairs was unable to attend but provided a statement of support, describing the workshop as “an important step in our genuine and ongoing discussion to work in partnership with Aboriginal and Torres Strait Islander people on real practical solutions”. The full statement was read to attendees by Uncle John Baxter during the morning session. The Hon. Jane Prentice MP, Assistant Minister for Social Services and Disability Services, attended the afternoon session and discussed the outcomes with participants. We welcomed the opportunity to provide the Assistant Minister with an overview of the major themes, issues, and priorities that emerged throughout the workshop. 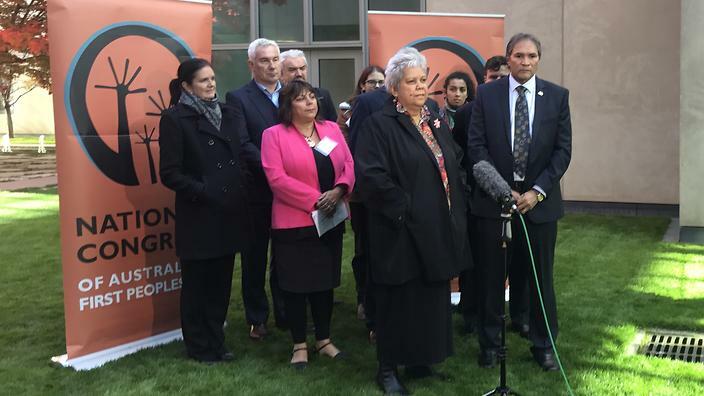 In June 2016, in the lead up to the Federal Election Campaign, Aboriginal and Torres Strait Islander leaders from health, justice, children and families, disability, and family violence prevention sectors united to call upon Australia’s political leaders to recognise the aggravated disadvantage of Australia’s First Peoples, and the fundamental role of Australia’s First Peoples and their community-controlled organisations in solving the root causes of this disadvantage, known as the The Redfern Statement. 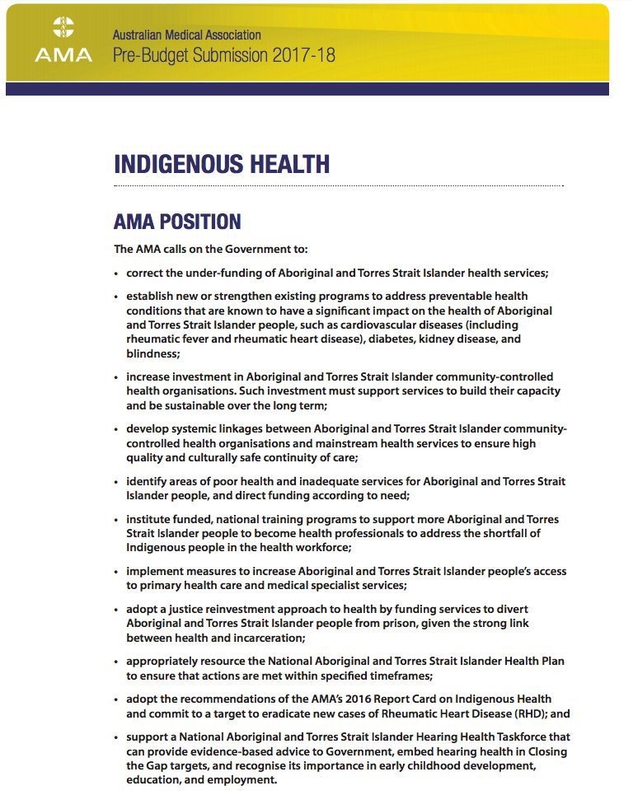 The Redfern Statement calls for changes across these sectors through structured engagement with Aboriginal and Torres Strait Islander people, and is supported by more than 30 major mainstream organisations. The disability workshop is one of five workshops that will be conducted this year. The relevant sector peak organisation will collaborate with the National Congress of Australia’s First Peoples to produce the remaining workshops. Each workshop will focus on a particular service sector. This Workshop was convened with the financial support of the Australian Government to enable us to deliver on the promise of The Redfern Statement – to articulate the solutions to the disadvantage experienced by our people with disability and our role in overcoming this disadvantage. The workshop also responds to the Government’s commitment in the National Disability Strategy 2010-2020 (the Strategy) Second Implementation Plan: Driving Action 2015-2018 to hold an annual solutions-focussed workshop focussed on improving outcomes for Aboriginal and Torres Strait Islander people with disability. The prevalence of disability among Aboriginal and Torres Strait Islander population groups is substantially higher than that for the general population. The best available data would suggest it is at least twice that of non-Aboriginal population groups. 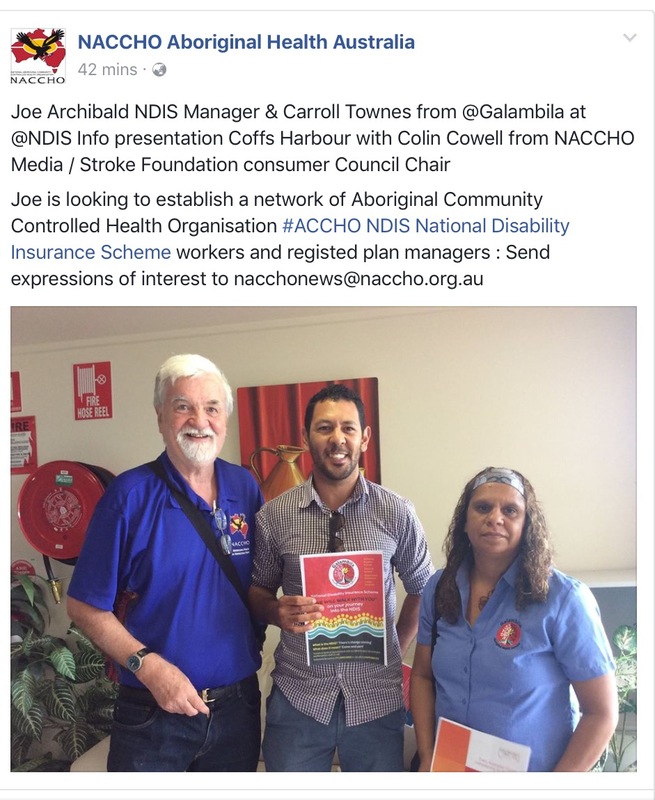 There are at least 60,000 Aboriginal and Torres Strait Islanders across Australia who live with a severe or profound disability and who thus are part of the core target group for the National Disability Insurance Scheme. The disadvantage experienced by Aboriginal and Torres Strait Islanders with disability and their families is intersectional. It arises because of the systemic barriers they face as a person who is both Aboriginal or Torres Strait Islander AND a person with disability. Intersectionality compounds the disadvantage, in that the systemic barriers accumulate across a person’s life. Aboriginal and Torres Strait Islanders with disability are, for example, many times more likely than other Indigenous persons, and many more times likely than non-Indigenous persons to experience family violence, removal from their families, and to be in contact with and incarcerated in the criminal justice system. The effect of intersectionality on the health and social outcomes of Aboriginal and Torres Strait Islander people with disability can now be quantitatively demonstrated using data from the Australian Bureau of Statistics (ABS). There is a serious problem of under-reporting of impairment and disability in mainstream service systems. Therefore, Aboriginal and Torres Strait Islanders with disability do not always receive appropriate supports and opportunities, even in circumstances where these supports would be readily available. A major contributing factor in the under-reporting of Aboriginal and Torres Strait Islanders with disability is the entrenched distrust of mainstream service systems within our communities, and the subsequent reluctance of our families and communities to engage with these systems out of fear that this will result in unwanted surveillance and intrusion, including the removal of our children from our families. Australia’s First Peoples have a strong positive tradition of inclusion of persons with disability within our families and communities. We have never, and do not now, see our family and community members with disability as outsiders. This is a major source of strength. 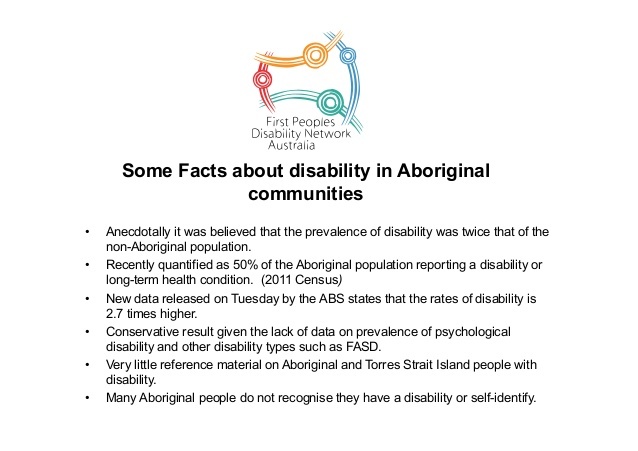 The inclusion of people with disability within Aboriginal and Torres Strait Islander communities can be demonstrated in the ABS data. We are capable of, and ready to do, the work that is necessary to overcome the disadvantage experienced by Aboriginal and Torres Strait Islanders with disability. We call upon government and the wider Australian community and our governments to recognise and support our capabilities to do so. 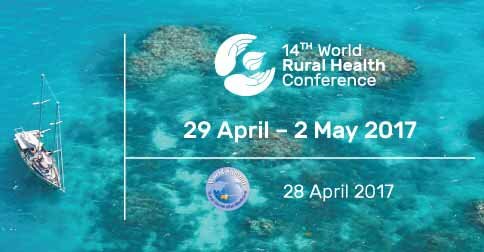 Develop strategies to address the detrimental effects upon the health and wellbeing of Aboriginal and Torres Strait Islander people with disability who experience the combined effects of racism and ableism. In conclusion, we acknowledged that common goals, and respectful partnerships such as those within the Redfern Statement alliance and between FPDN and governments are key to achieving the outcomes outlined above. Together we must stay the course. Redfern Statement Disability Workshop Communique May 2017. ” Treasurer Scott Morrison says the 2017 Budget will show that the Government understands the frustrations of many Australians. For Indigenous Australians, the greatest frustration is the slow pace of change in closing the gap in disadvantage, and the continuation of poor health and wellbeing. The Australian Government must commit to a new relationship and genuine partnership with Aboriginal and Torres Strait Islander people in decisions made about Indigenous Australians; decisions that address housing, health, education, justice, disability and representation. ” Peak Indigenous groups have responded to the federal budget, saying its new measures are out of touch and fail to reach real solutions for Indigenous Australians . “The 2017 budget fails to deliver for Aboriginal and Torres Strait Islander Australians,” leader of the opposition Bill Shorten, Senator Patrick Dodson, Warren Snowden, Linda Burney and Senator Malarndirri McCarthy said in a joint statement. While the budget includes piecemeal proposals for better employment and health outcomes, there is no comprehensive strategy to make progress on the stalled Closing the Gap targets, or to address other longstanding issues such as the incarceration crisis. The budget also fails to secure the future of the National Congress of Australia’s First Peoples with proper funding. 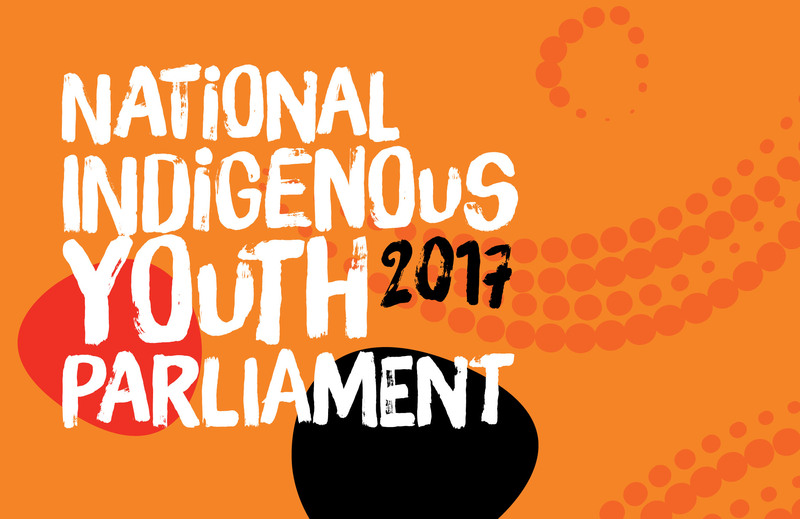 Congress is our independent, elected, national Indigenous representative body – it must be respected and resourced. Leader of the opposition Bill Shorten, Senator Patrick Dodson, Warren Snowden, Linda Burney and Senator Malarndirri McCarthy said in a joint statement. “Whatever happened to Prime Minister Turnbull’s flagship health reform? This time last year Malcolm was out there spruiking his Health Care Homes initiative to revolutionise Medicare for chronic disease, yet last night we saw the funding for this initiative cut and kicked two years down the road while trial sites are delayed until October. “Not only are they unpicking their own reform program designed to treat people with chronic illnesses, there is next to nothing for programs to help prevent Australians developing debilitating chronic diseases like obesity, diabetes and heart disease in the first place, particularly in children. The Treasurer might have vaguely mentioned Aboriginal and Torres Strait Islander issues in his budget speech, but the detail doesn’t back up the rhetoric, Australian Greens Senator Rachel Siewert said today. “What you don’t see included in the budget papers can be just as concerning as what you do include. This is definitely the case for Aboriginal and Torres Strait Islander issues in the 2017 Federal Budget. “There is no commitment resources to the Redfern statement, this is despite it being a document backed by Aboriginal and Torres Strait Islander organisations and peoples as essential to close the gap. “The Redfern Statement is a strong blueprint to close the gap and finally reconciling our First Peoples but remains unaddressed by the Federal Government, who keep saying they will listen but then don’t. “There is also no addition funding for National Congress of Australia’s First People. At the moment that team are under resourced, having had their funding cut in a previous budget, they need more funding desperately. “The Abbott Government gutted half a billion from Aboriginal and Torres Strait Islander funding when they rolled out the Indigenous Advancement Strategy. Although there has been a marginal increase, it does not come close to topping that money back up to original levels. 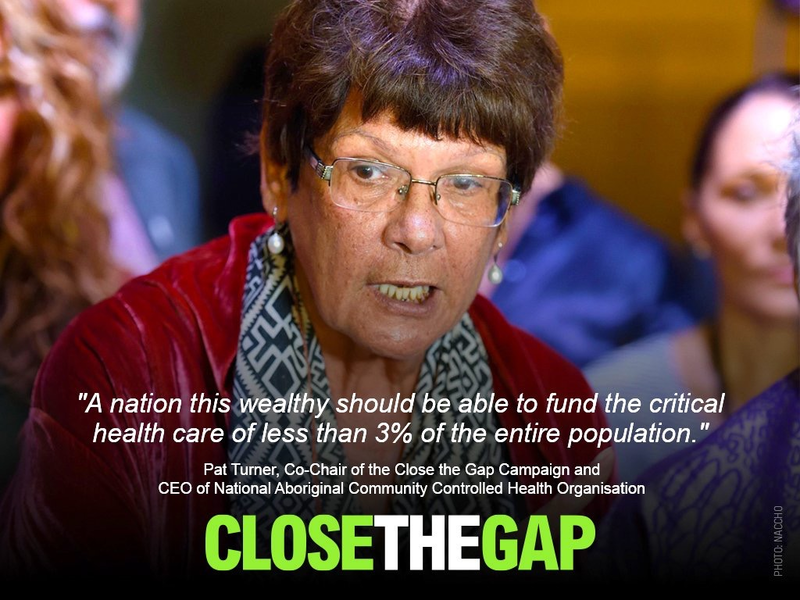 “When key markers to Close the Gap continue to go backwards, and the Minister is scratching his head as to why, perhaps it is because they removed a lot of money and pushed many of the services to be mainstream rather than Aboriginal-led. “The Government should actually listen to the host of Aboriginal voices who are offering solutions to reduce disadvantage and reconcile with our First Peoples. We need to be moving forwards, not backwards”. 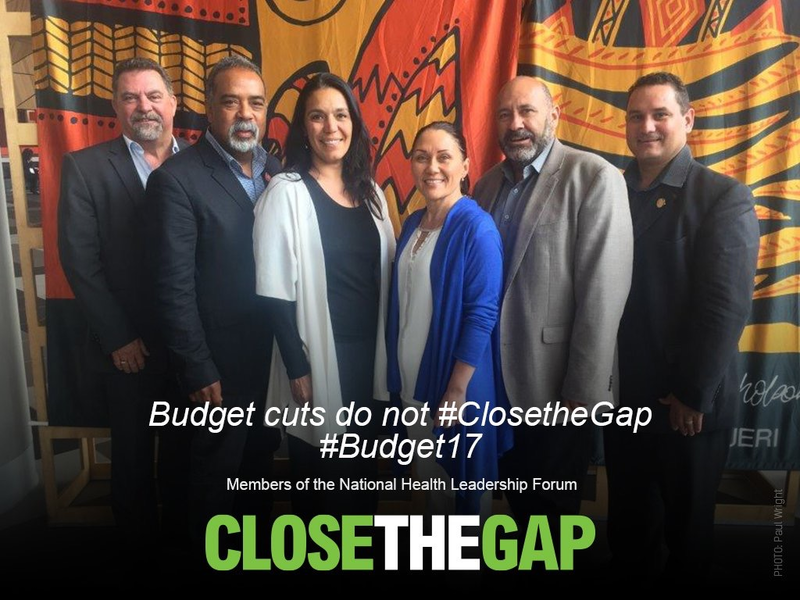 Indigenous peak bodies have converged on Canberra this week to respond to the federal budget, announced on Tuesday night by Treasurer Scott Morrison. They say the Turnbull Government is out of touch and many of its measures affecting Indigenous Australians are not enough. They’re calling on the Coalition to work with First Nations peoples to reach real solutions. National Congress of Australia’s First People Co-Chair Rod Little says Indigenous people are invisibile. “We should be featuring more prominently in a national budget,” he said. Congress Co-Chair Jackie Huggins agrees. “We have been lumped in with a whole range of the people and really buried under those statistics,” she said. The Secretariat of National Aboriginal and Islander Child Care CEO, Gerry Moore, says the budget fails Indigenous children. “This isn’t anywhere near enough and the government need to think seriously about the children of our future, Aboriginal and Torres Strait Islander children,” he said. NATSILS CEO Cheryl Axleby says while she welcomes the coalition’s reversal of cuts to community legal centres, she warns against action stopping there. “We’re calling for a justice target, in line with the Closing the Gap targets, we need to have a focus on justice if we really want to see solutions to addressing this issue in Australia,” she said. Damien Griffis, from the First People’s Disability Network, says the Medicare price hike to fully fund the National Disability Insurance Scheme is not enough. He says an Aboriginal-owned and operated disability service system is needed. “That needs to happen urgently. It needed to happen yesterday frankly, so that we can get equal and fair access to the NDIS,” he said. Labor MP Linda Burney says the Government’s economic blueprint neglects Indigenous Australians. “It has no vision, it does not anticipate the real issues that are coming up for the Aboriginal space. It also is going to put more money into the pockets of bureaucracies and consultants not out there on the ground where it’s needed,” she told NITV News. Article 2 Does the 2017 Budget show that the Government understands the frustrations of Indigenous Australians? Treasurer Scott Morrison says the 2017 Budget will show that the Government understands the frustrations of many Australians. For Indigenous Australians, the greatest frustration is the slow pace of change in closing the gap in disadvantage, and the continuation of poor health and wellbeing. The announcement to lift the freeze on Medicare rebates and increase the Medicare levy is encouraging for disadvantaged Australians. The lift allowing GP’s to charge more for their services, will hopefully see bulk-billing practices remain operational or increase in number, and the increase to the levy to provide long term secure funding for the NDIS is wanted. AIDA welcomes the announcement of the Indigenous Research Fund but would have preferred more commitment to resourcing existing Indigenous health programs and service delivery. We also welcome the budget measures that are specifically aimed at closing the employment gap, but we more commitment around the other health targets in needed. It has also been promising to see measures to enhance the delivery and relevance of the Indigenous Advancement Strategy. We note that it has already been reviewed by a Senate committee and the Australian National Audit Office and look forward to the implementation of the recommendations contained in those reports. Aboriginal and Torres Strait Islander rights organisation ANTaR suggested what could be funded immediately to start to signal that government is taking the health and wellbeing of First Peoples seriously. 7. Ensure adequate funding for Aboriginal Family Violence Protection Legal Services, including through allocating funding to ensure there is national coverage (regardless of geographic location) of FVPLS services. 8. Ensure funding for Aboriginal and Torres Strait Islander Legal Services (ATSILS) that is able to meet the level of need, including through implementing the Productivity Commission’s Recommendation from its Access to Justice Arrangements Inquiry Report to provide an additional $120 million of Commonwealth funding to the Legal Assistance sector. ” By any measure, Aboriginal and Torres Strait Islander people with disability are among some of the most disadvantaged Australians often facing multiple barriers to their meaningful participation within their own communities and the wider community. Meeting the needs of Aboriginal and Torres Strait Islander people with disability is one the most critical social justice issues in Australia today. The prevalence of disability among Aboriginal and Torres Islander people is significantly higher than that of the general population. 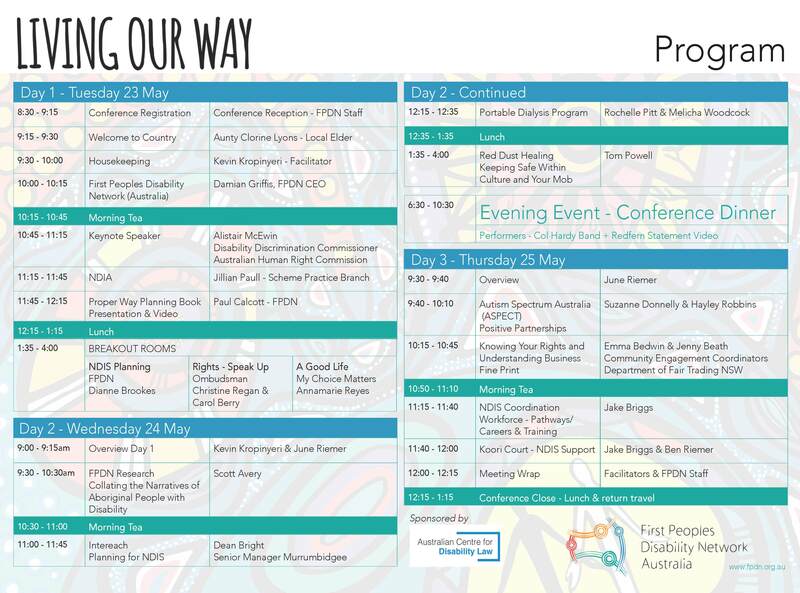 First Peoples Disability Network is the peak organisation representing Aboriginal and Torres Strait Islander people living with disability will be meeting in Sydney today with the Redfern Statement members including Congress ( Represented by Rod Little, Gary Oliver and Jackie Huggins ) and the National Aboriginal Community Controlled Health Organisation (NACCHO) represented by Dawn Casey. 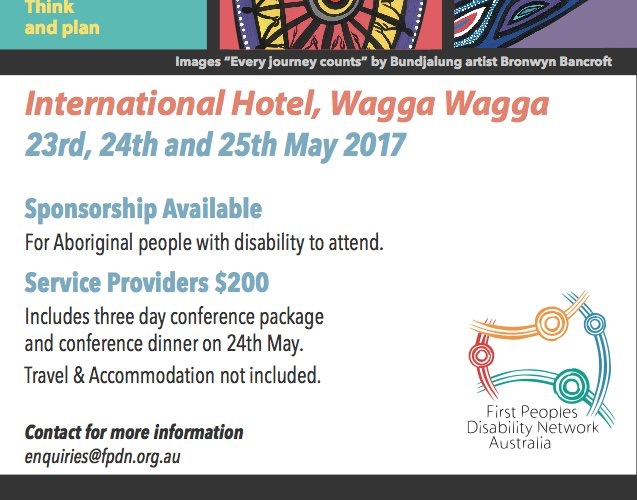 FPDN’s vision is a just and inclusive society, in which First Peoples living with disability are respected and valued for their culture, history and contribution to contemporary life, and in which their human rights are recognised, respected, protected and fulfilled. First Peoples Disability Network is governed by Aboriginal and Torres Strait Islander people living with disability. FPDN is a member of the Disabled People’s Organisations Australia (DPO) alliance. The Redfern Statement was released during last year’s Federal Election campaign on 9 June 2016 by Aboriginal and Torres Strait Islander leaders from health, justice, children and families, disability, and family violence prevention sectors. By any measure, Aboriginal and Torres Strait Islander people with disability are among some of the most disadvantaged Australians often facing multiple barriers to their meaningful participation within their own communities and the wider community. Meeting the needs of Aboriginal and Torres Strait Islander people with disability is one the most critical social justice issues in Australia today. There is a significant opportunity to address the disadvantage experienced by Aboriginal and Torres Strait Islander people with disability in coming years. The disability sector is going through substantial change and reform, due to the National Disability Strategy (NDS) and the National Disability Insurance Scheme (NDIS) and associated sector reforms. Aboriginal and Torres Strait Islander People with disability have limited access to services and supports for a range of reasons. A specific strategy targeting the key challenges is required to ensure that the disability support system is accessible and responsive to Aboriginal and Torres Strait Islander people with disability and their families. This strategy must build the capacity of individuals with disability and their families, and the disability support system. A specific strategy mitigates the risk of entrenching and exacerbating the disadvantage experienced by Aboriginal and Torres Strait Islander people with disability and their families. This workshop aims to identify and document solutions and to produce a 10-point plan that provides clear recommendations. The National Disability Strategy 2010-2020 provides an overarching national policy approach to improving access to support services and social outcomes for people living with disability, their families and carers. It was endorsed by COAG in 2011. Inclusive and accessible communities – including the physical environment, transport, communications, social and cultural life. 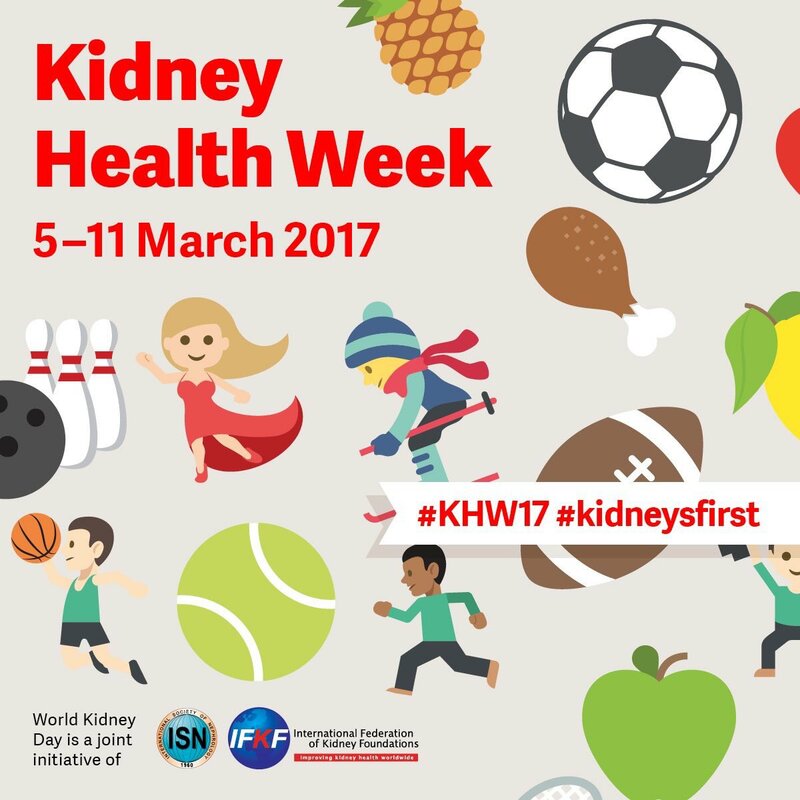 Health and wellbeing – access to health, interaction between the health and disability services. There is an action item under the National Disability Strategy for the development of an Aboriginal and Torres Strait Islander Disability Action Plan, which the Australian Government has been progressing, in consultation with FPDN and other disability organisations, for some time. Historically disability has been inappropriately included as a health issue. The Redfern Statement Leadership has acknowledged the importance of delineating disability from health. This outdated approach to disability is referred to as the medical model of disability, where the focus is diagnosis. The contemporary understanding of disability is the social model of disability which interprets disability as a product of social and environmental attitudes and responses to impairment. ‘Disability’ has the status of ‘Headline indicator’ under the Closing the Gap Framework, together with chronic diseases. This means that when there is a section on disability in Government service reports thereis a relatively narrow focus, often upon particular disability types such as the known incidence of psychical and sensory impairments. There is no Closing the Gap target for disability. 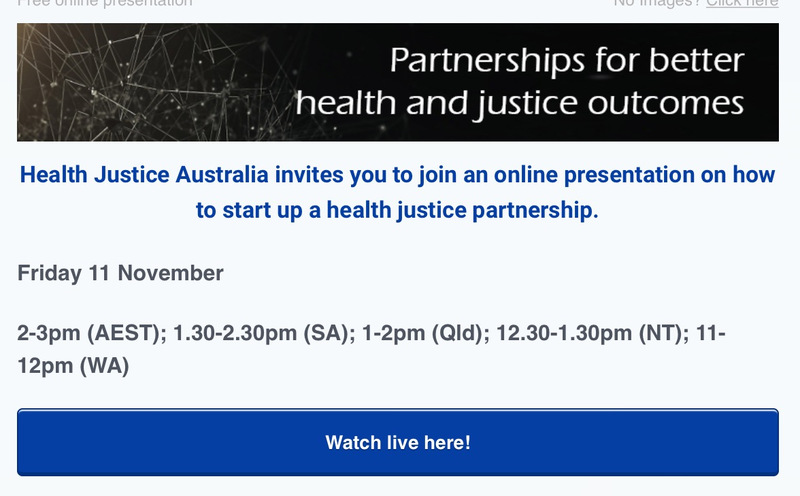 This means that there is no concentrated policy focus on Aboriginal and Torres Strait Islander disability, supported by a national partnership agreement. 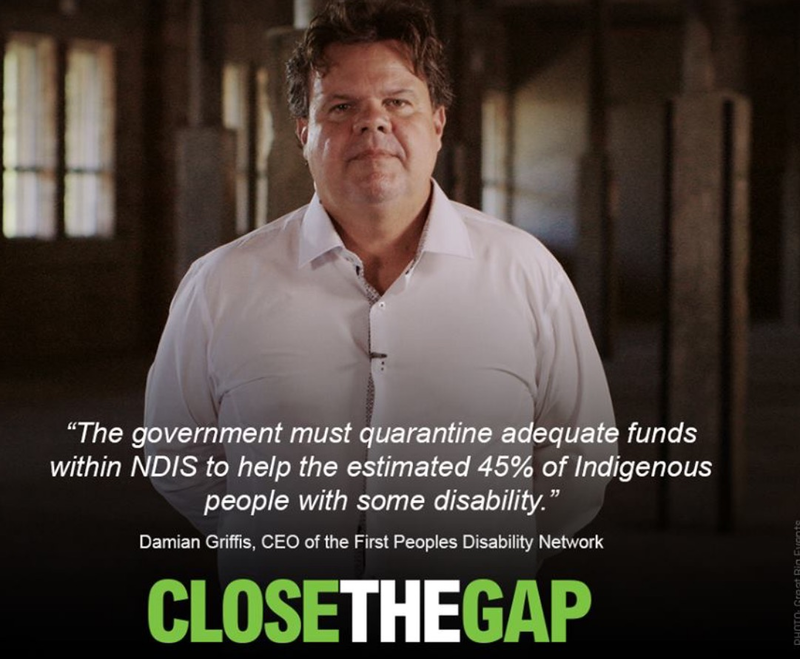 In 2012, First Peoples Disability Network was invited by the Government to be involved in the development of a Closing the Gap target for disability. 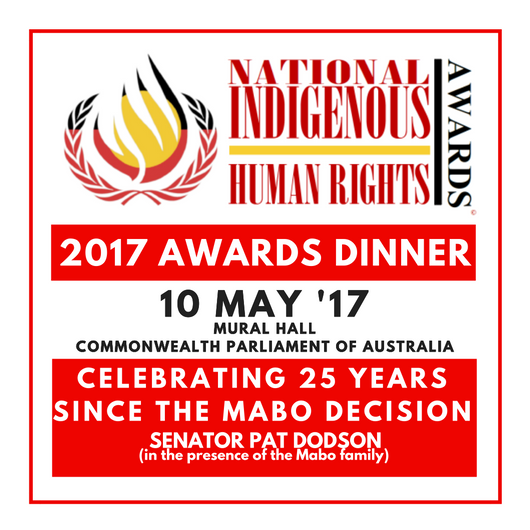 A target of 90% of Aboriginal and Torres Strait Islander people eligible for the NDIS to have access to the Scheme was recommended. This is yet to be included in the framework. 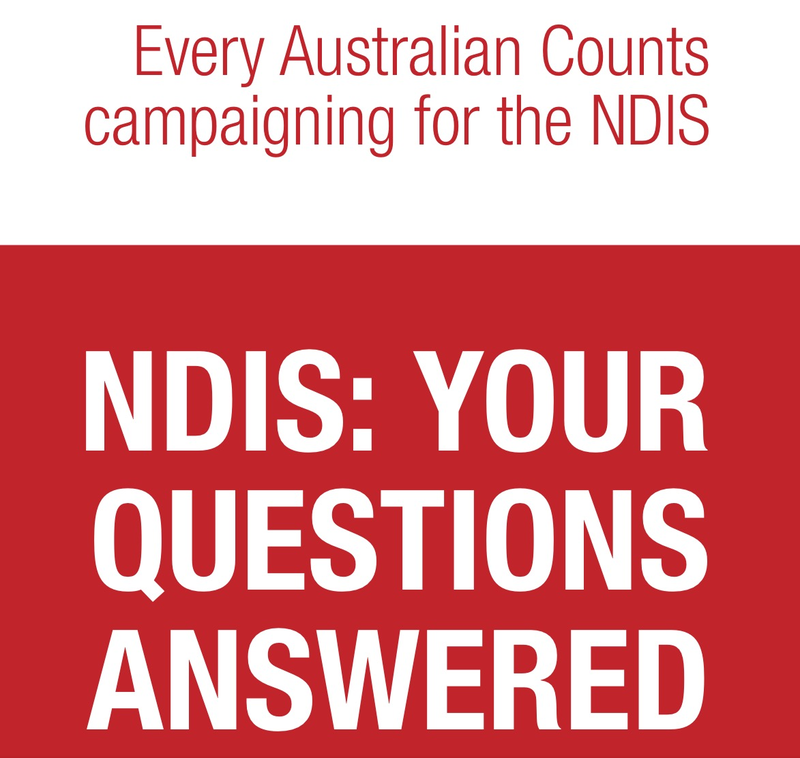 In late 2015, FPDN and other disability organisations consulted with the NDIA to produce an engagement strategy for the implementation of the NDIS in Aboriginal and Torres Strait Islander communities. This was released in March 2017. 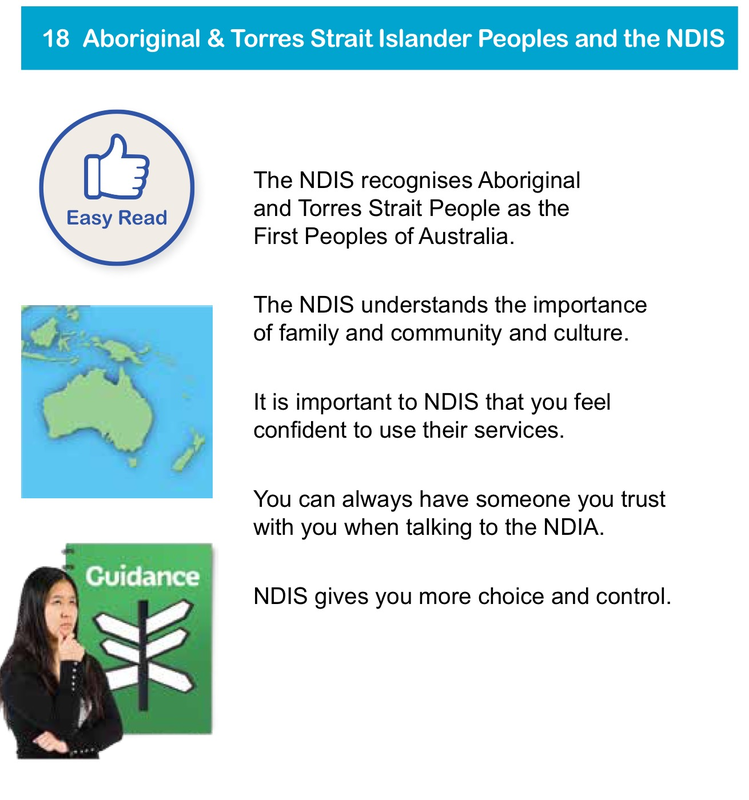 The NDIS Aboriginal and Torres Strait Islander Engagement Strategy document is intended as a guide to NDIA staff on the respectful engagement with Aboriginal and Torres Strait Islander people, particularly on cultural dimensions to understanding disability and respect for ways of doing business in Aboriginal and Torres Strait Islander communities. It is not a comprehensive integrated strategy to improve access to the NDIS by Aboriginal and Torres Strait Islander people. Law Reform Commission inquiry into the incarceration rate of Aboriginal and Torres Strait Islander peoples (2016-). They don’t acknowledge or address the intersectional impact of Aboriginality and disability. The National Aboriginal and Torres Strait Islander Health Plan – Implementation Plan contains a linkage objective to disability, without listing any specific activities or initiatives. Recent consultations on the Implementation Plan by the Department of Health do not include disability as a social determinant to Aboriginal and Torres Strait Islander health outcomes. The National Health Performance Framework contains a very short reference to disability, although there has been no engagement with Health Department from the Aboriginal and Torres Strait Islander disability sector on the content and analysis. The Foetal Alcohol Spectrum Disorders (FASD) Action Plan focuses on efforts to finalise and disseminate the National FASD Diagnostic Tool, and prevention of FASD. The National Aboriginal and Torres Strait Islander Education Strategy, endorsed by Education Ministers in September 2015, has no specific reference or strategies to address to the intersectional impact of disability on education outcomes. The introduction of the National Disability Insurance Scheme (NDIS) has the potential to deliver significant improvements and aims to give people with disability, who qualify for the scheme, access to ‘an ordinary life’. The national discussion around disability, supports and disability rights that has ensued has highlighted the existing gaps in access to services and supports and infrastructure that many Aboriginal and Torres Strait Islander people face. Closing these gaps must be part of the rollout of the scheme and the associated sector changes to achieve the equitable rollout of the scheme, and ensure equitable access to services and supports for people not eligible for the scheme. Without specific community and service development strategies targeted at Aboriginal and Torres Strait Islander population groups and communities, national the disability reforms will do little if anything, to address the aggravated disadvantage of Aboriginal and Torres Strait Islanders with disability and their families. A dedicated, continuing, communication strategy based on direct outreach to Aboriginal and Torres Strait Islanders and their communities utilising culturally sensitive materials and culturally appropriate/competent communication methods. 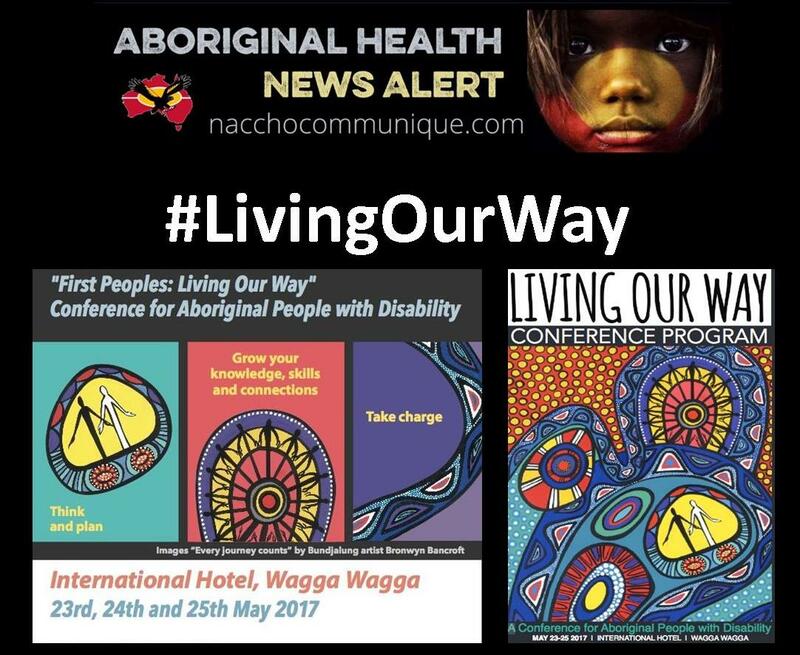 Active linking of Aboriginal and Torres Strait Islanders with disability and their families with NDIS implementation agencies and services. Culturally specific individual advocacy support for Aboriginal and Torres Strait Islanders with disability and their families. Capacity-building of Aboriginal and Torres Strait Islanders with disability and their families in relation to person-centred services and self-directed supports. Development and dissemination of good practice culturally appropriate models of person centred, self-directed disability support services for Aboriginal and Torres Strait Islanders with disability and their families. Sustained cultural competence training and other capacity building for mainstream disability support services in relation to working with Aboriginal and Torres Strait Islanders with disability. Development and dissemination of good practice culturally appropriate models of remote service delivery. A recruitment, qualification, professional development, retention and career development strategy targeted at Aboriginal and Torres Strait Islanders entering the disability sector. Capacity-building of Aboriginal and Torres Strait Islander service delivery organisations to provide disability support services under the NDIS. It is essential that this proposed national implementation strategy is developed and implemented in close consultation with Aboriginal and Torres Strait Islanders with disability and their families, and with their representative groups. The establishment of a national advisory structure comprised of appropriate representatives of Aboriginal and Torres Strait Islanders with disability and family members would be one key means of achieving this. It is also essential that, as far as practicable, this strategy is led and implemented by appropriate Aboriginal and Torres Strait Islander specific organisations, including the First Peoples Disability Network (Australia). 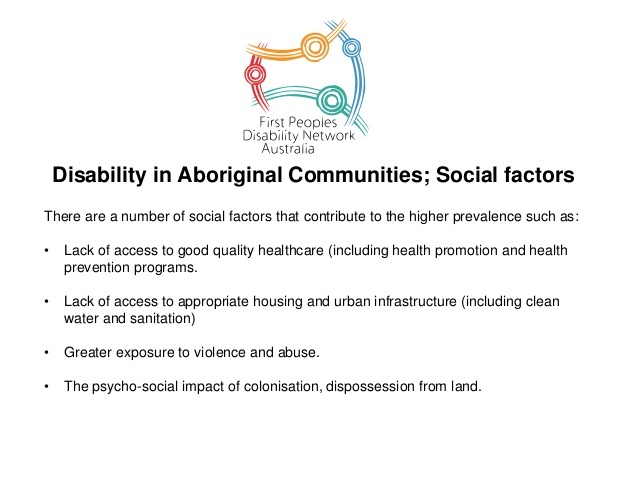 This is key to the strategy being viewed as legitimate by Aboriginal and Torres Strait Islanders with disability. 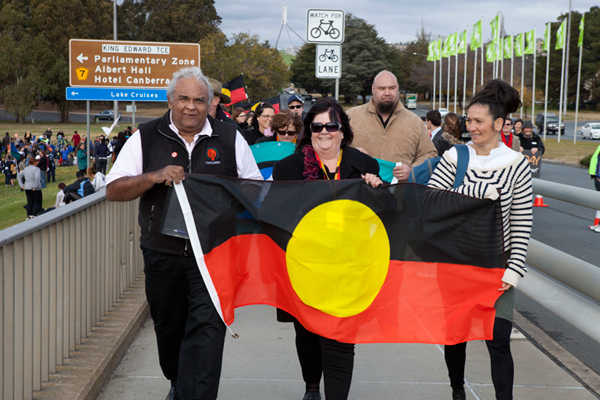 Four years ago, FPDN launched its ten-point plan for the implementation of the NDIS in Aboriginal and Torres Strait Islander Communities at Parliament House, Canberra. The time has come to revisit the plan and update it in light of the ongoing rollout of the NDIS and the changing disability sector. The ten-point plan must apply to all First Peoples with disability as many will not be eligible for the NDIS. These strong words are so true. I look at how my behaviour has changed with the brain tumour. I shudder when I think of the things I have said to my children. The reason I’m vague on it is I actually don’t think it’s a day to remember. It’s not a celebratory day. Cancer is a leading cause of death among Indigenous Australians, but fear, stigma and shame mean it is rarely spoken about. Ms Colleen Lavelle’s a Wakka Wakka woman, from Queenslandknown as @Proudbacksista tumour has been deemed inoperable, which means it’s considered terminal. 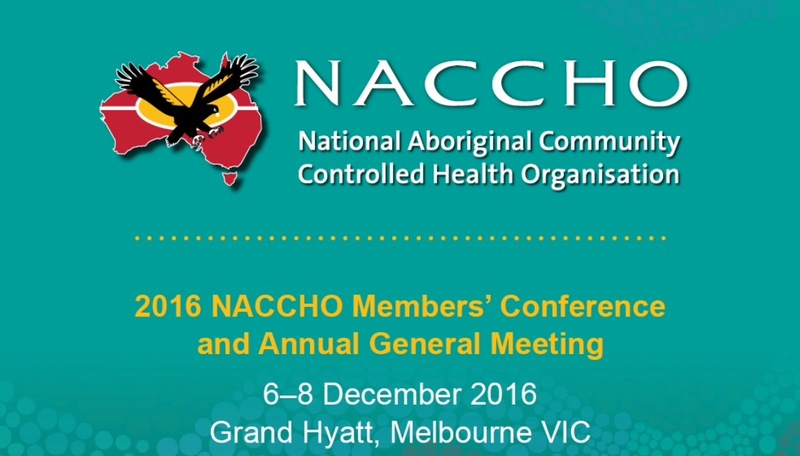 NACCHO Aboriginal Health : Death by #racism: Is bigotry in the health system harming Indigenous patients ? Colleen lives in Brisbane and through her blog she has become a support person for other Aboriginal people facing cancer, helping them with practical matters and being a friendly voice on the other end of a phone line. She also accompanies some patients to hospital appointments and would like to see it made easier for Aboriginal volunteers to do such work. “If you come from the Torres Strait and you’ve come down here and someone’s speaking to you really fast, rattling off all these medical things you’ll kind of be going, ‘what?’,” she said. Close the Gap should be so much more than a photo opportunity or a morning tea. There are ways that everyone can help. I am going to share ten simple ones that I have been trying to get happening for years. More Indigenous hospital liaison officers – Whatever title you use, we need more people in the hospital working for us. Big hospitals often only employ two, that is not even close to being enough. They should be employed around the clock. Indigenous hospital volunteers – Hospitals need to have a separate army of volunteers, who deal exclusively with Indigenous patients, to spend time with the person from a remote area in a city hospital. To sit with someone having a long treatment. Just a friendly face in an alien environment. Cultural Awareness Training (CAT) – Should be compulsory with all hospital staff, from the cleaner to the director. 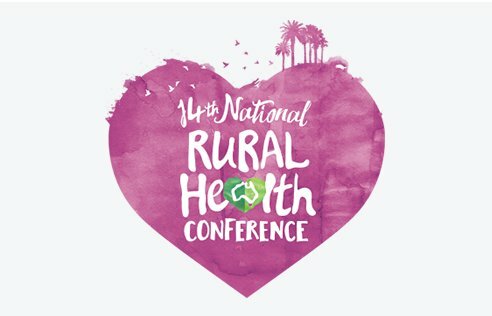 This training should address the issues and problems in health, but also needs to be localised to have the Traditional Owners from the area to share their knowledge. To truly let people understand, I am not talking a one of two-hour session a year, but a long, fully-formed training, with refresher courses each year. All medical and Allied Health professionals should do, and be assessed on, Cultural Awareness on a regular basis, and this needs to be registered. 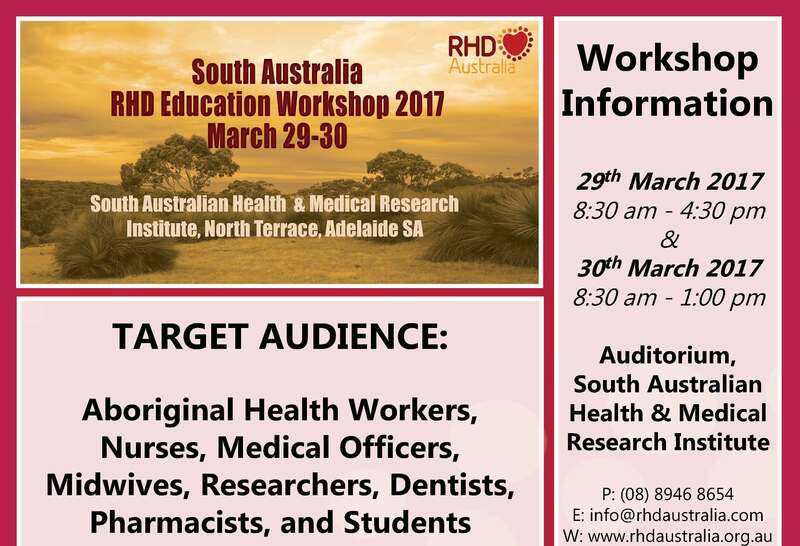 It is not good enough when a health professional does one course on Indigenous People and 20 years later still think that was enough. General Practice also need to have CAT, even if they are not signed on to CTG, because they are going to be seeing Indigenous patients. General Practice incentive payments – GPs must lose their incentive payments if they sign on for the incentive and, during that time they don’t see an Indigenous patient. Again, they should lose the bonus if they are signed up and do not annotate the prescriptions for patients. Indigenous people have the right of choice – We should be able to see a private GP or the local Indigenous Medical Service, or both if we want, but some funding seems to steer us towards the Indigenous Medical Service. This can be hard if it’s a long way from your home and you have to depend on public transport. Employ more Indigenous people in the health sector, not just doctors – It can be as simple as a receptionist, who makes a difference. 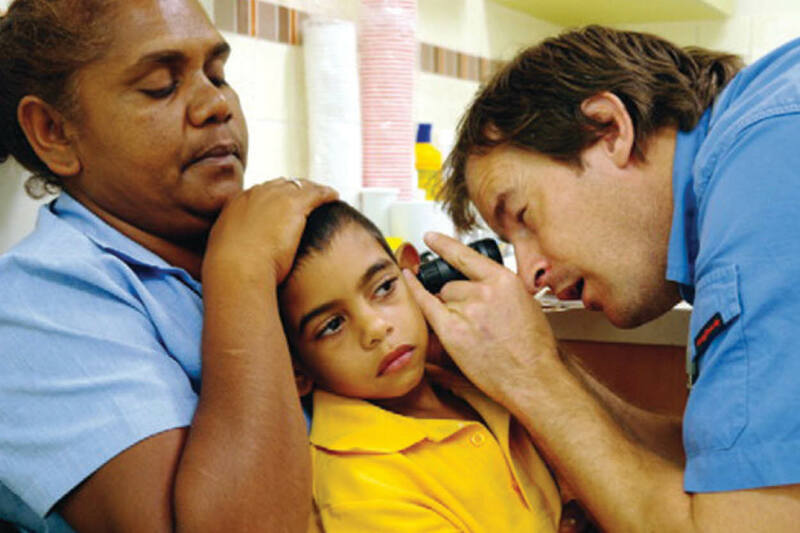 Indigenous patients must be heard – Not just in the surgery but on national committees. Our experiences must be more than just fodder for researchers or funding applications. 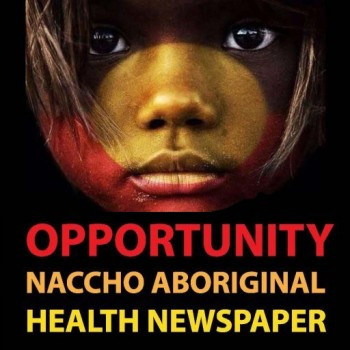 Buck-passing – PHNs, Division of General Practices and other organisations, must stop handing over Indigenous units to others. You have patients that see so many doctors, you have to be responsible. Handing units over to Indigenous Medical Services etc, is passing the buck. It takes away our free choice. It is a way of saying you are not interested in our wellbeing. Respect – Invite Elders to your hospital, clinic, whatever, on a regular basis, consider having an Elder in residence at your local hospital. 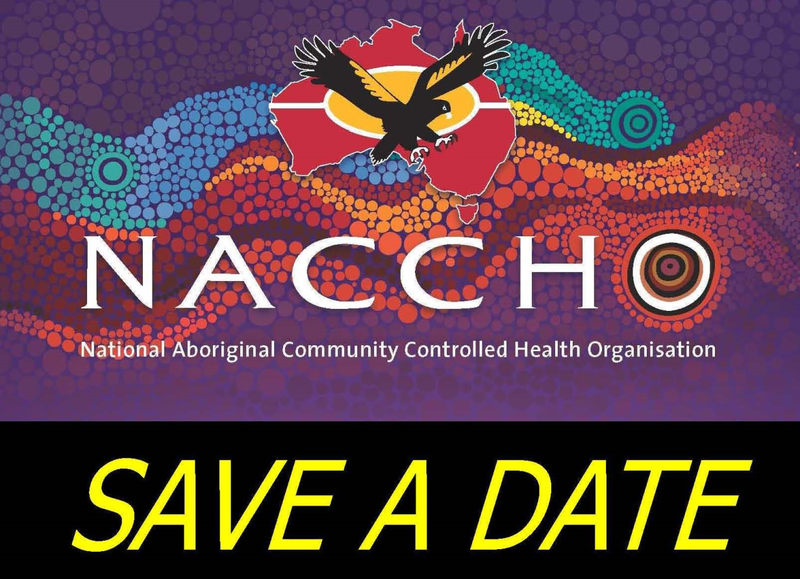 Recognise and celebrate our important dates – It smacks of racism if a hospital is decked out in green and shamrocks everywhere for St Patrick’s day and come NAIDOC, there is a morning tea, hidden away, with only a few people involved. Share it. Don’t even get me started on Australia Day. (Okay, just a little bit) Understand that we don’t think it’s great to wave the flag or want to be in your premises when you have complete overkill of decorations and start talking about how wonderful it is. Aboriginal Australians are less likely to be diagnosed with cancer, but significantly more likely to die of the disease. Often, symptoms and diagnoses are ignored because of the fear surrounding cancer. Lateline spoke to some Aboriginal people about how they dealt being diagnosed and how they’re trying to break down taboos in their communities. Rodney Graham literally ran away from his diagnosis in 2015. For seven months he didn’t go back to his doctor after he was told he had bowel cancer. Eventually though, he mustered the courage to deal with the diagnosis and get treatment. 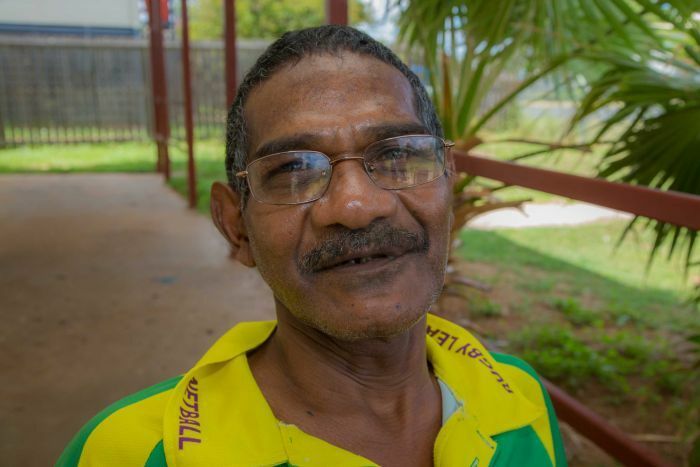 He had to travel 700 kilometres from his community of Woorabinda, in central Queensland, to Brisbane to be operated on. “A big city like that, I don’t even like going to [Rockhampton] really. I can’t stand Rocky. But Brisbane that was a step up you know,” he said. Now Mr Graham is happy to talk about his illness and wants to help others in his community face up to cancer. “It might happen to someone else and they say, ‘Well we’ll go see Rodney, he knows all about it’,” he said. Mr Graham gave up drinking years ago and he said it probably saved his life. “I think if I was still drinking I wouldn’t be here, you know what I mean,” he said. Aunty Tina has survived cancer, but seen several close relatives succumb to the disease. “One minute you’re sitting down there with that person, that person is so healthy, and then the next time you see them they’re that sick, they’re that small you can hardly recognise them,” she said. “People think of it as the killer disease. Aunty Tina said people need to know there is help available for cancer sufferers. 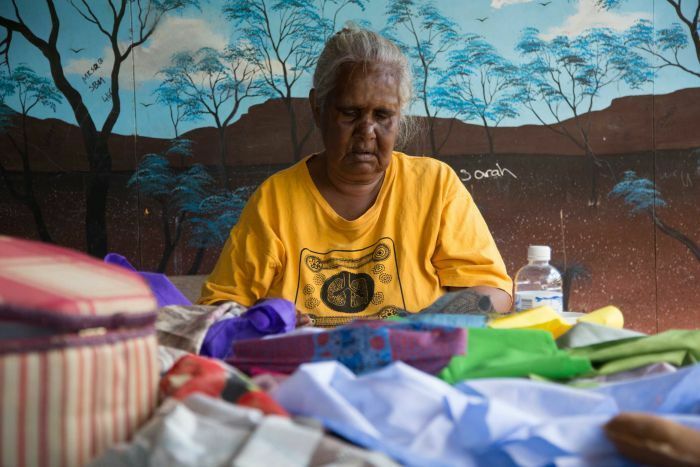 She is part of the Woorabinda Women’s Group who are working to raise awareness in the community about cancer so sufferers don’t feel isolated. “When you’re well and up and running, you’ve got that many friends,” she said. “All of a sudden you get sick, you find out you’ve got cancer, you’ve got nobody, it feels as if you’re on your own. “There were times when I just wanted to go and commit suicide through the depression. 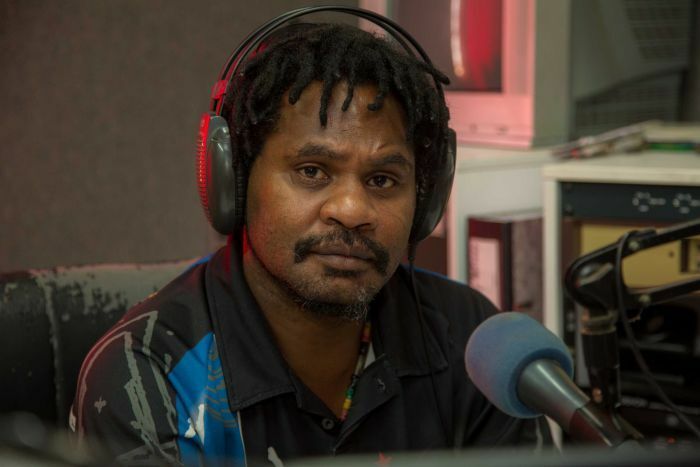 Sevese Isaro, or Tatay as he’s known locally, is Woorabinda’s radio host. He knows first-hand how hard it can be to talk about cancer, having lost his father to the disease just a few years ago. “Everyone just tried to stop talking about it,” he said. He said many people don’t go to the doctor when they suspect they could have cancer. “They know that there’s something wrong with them, but they don’t want to go because they’re frightened of the answer,” he said. ” This report focuses on the experiences of one particular vulnerable group—Indigenous people living in remote areas. Remote Indigenous Australians face significant disadvantage and unique cultural barriers in accessing a range of government services, including DSP. The qualification criteria for DSP set a high bar and the claim process is rigorous. Even those applicants who are familiar with the income support and health systems say they find the DSP claim process complex, lengthy and confusing. 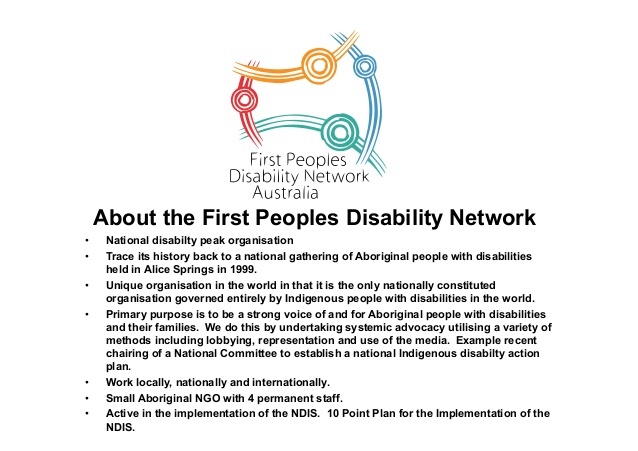 ” FPDN’s vision is a just and inclusive society, in which First Peoples living with disability are respected and valued for their culture, history and contribution to contemporary life, and in which their human rights are recognised, respected, protected and fulfilled. Commonwealth Ombudsman, Colin Neave AM, released his report today into the accessibility of Disability Support Pension (DSP) for remote Indigenous Australians. The Ombudsman’s inquiry responded to complaints from Indigenous Australians living in remote areas who were experiencing issues claiming DSP and with the assessment processes used by the Department of Human Services (DHS). “We found remote Indigenous Australians face several barriers when claiming DSP. It is harder to access medical services, get appropriate medical evidence to support their claims and engage with DHS’s job capacity and medical assessment processes,” Mr Neave said. The Ombudsman has made a number of recommendations which seek to address these issues.  difficulties discussing conditions and their functional impact with health professionals in a meaningful way, due to language and cultural barriers. Overall, DHS and the Department of Social Services (DSS), which is responsible for the relevant legislation and policy, responded positively to the investigation, agreeing to all recommendations. “DHS is taking steps to improve its DSP assessment processes for remote Indigenous Australians, but more needs to be done,” Mr Neave said. The assistance received from DHS throughout the investigation and report drafting process was also acknowledged by the Ombudsman. Over the past twelve months the Ombudsman’s office has investigated a number of cases in which Indigenous people and their advocates have complained about decisions to refuse Disability Support Pension (DSP) claims. We do not usually investigate where, as in most of those cases, a complainant has a right of review. However, the focus of these complaints was the Department of Human Services’ (DHS) assessment process. The complainants argued that their medical impairments were not properly or appropriately assessed. We decided to investigate their circumstances and examine DHS’s approach. Over recent years the qualification criteria for the DSP has been significantly revised and tightened. While it is not the role of the Ombudsman’s office to comment on the merits of government policy, it is appropriate that we are alert to situations where the practical application of a policy has unintended consequences. This includes the potential to create inequitable access or outcomes that are inconsistent with legislative intent and do not reflect the principles of good administrative decision making. We acknowledge that DHS assesses over 100,000 DSP claims per year. The majority of these are processed without significant cause for complaint by claimants. However, the experience of the majority should not necessarily be taken as an indication that the process is working for the most vulnerable in the community. This report focuses on the experiences of one particular vulnerable group—Indigenous people living in remote areas. Remote Indigenous Australians face significant disadvantage and unique cultural barriers in accessing a range of government services, including DSP. Complaints made to our office, along with the anecdotal feedback provided by peak bodies, advocates and community organisations, show that Indigenous people living in rural and remote Australia experience particular difficulty in preparing applications for DSP and meeting the high standard of evidence required by social security law. This report centres on complaints about the DSP claim process and uses them to illustrate some of the common challenges Indigenous people living in remote areas of Australia face when making DSP claims. The report provides a snapshot of areas where the DSP assessment process has fallen short. Although the number of complaints we receive about DSP is small compared to the total number of DSP claims, the challenges faced by remote Indigenous Australians in navigating the DSP claim process are real and the impact of these challenges can be disproportionately large, given the claimants’ particular vulnerabilities. We acknowledge the initiatives DHS has implemented to improve access to DSP for remote Indigenous Australians. Despite these efforts, we continue to receive similar complaints at the time of publishing this report. The complaints suggest there remains a gap between DHS’s service delivery commitments and the reality experienced by Indigenous people in remote areas. The report makes recommendations about the job capacity and medical assessment processes, including the way the assessments are carried out and the information given to Commonwealth Ombudsman—Department of Human Services: Accessibility of Disability Support Pension for remote Indigenous Australians and sought from medical professionals providing reports for DSP claims. We have recommended steps to increase awareness of the eligibility requirements for DSP, including the need for some applicants to have participated in a ‘program of support’. Given the recent changes to the DSP claim process and the programs of continuous improvement which DHS has outlined in response to our investigation, we have also recommended that the department establishes an implementation, monitoring and evaluation framework to assess the effectiveness of those changes. “At the same time Aboriginal and Torres Strait Islander women are experiencing high rates of violence, being 34 times more likely to be hospitalised for family violence related assault. Laws that are meant to protect persons with disabilities in the criminal justice system can lead to detention without an end date. This is particularly so for Aboriginal and Torres Strait Islander People with Disabilities according to researchers at the University of Melbourne and University of New South Wales. Researchers have collaborated with the Victorian Aboriginal Legal Service and the North Australian Aboriginal Justice Agency to deal with the support needs of accused persons with mental disabilities. 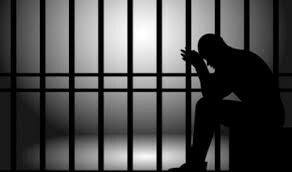 The Unfitness to Plead and Indefinite Detention of Persons with Cognitive Impairments project is about providing support to people with disabilities in the criminal justice system to prevent their indefinite detention. The researchers recently gave evidence to a Senate Committee Inquiry into the Indefinite Detention of People with Cognitive Impairment in Darwin last week. The research team, which includes a number of Aboriginal and Torres Strait Islander researchers and advocates, have just concluded a six-month trial of supports for accused persons with disabilities when they reach the court system. Professor Kerry Arabena, a chief investigator on the project, says Indigenous people with disabilities are clearly over-represented in the criminal justice system. “It’s clear we need to change to law to prevent indefinite detention, but we also need to make sure the supports are available on the ground. People with disabilities who come into contact with the criminal justice system need to be connected to appropriate support,” she said. “This is especially the case for young people with disabilities in contact with the criminal justice system. We should be intervening as early as possible in a child’s life to identify and address disabilities, and support their parents to care for their child as much as possible. It is a travesty that in 2016 we can have over representation in the criminal justice system because we haven¹t prevented or addressed early health, developmental vulnerabilities or intergenerational trauma in the first 2 years of life. We do not need prison solutions for health issues.” Professor Arabena said. In many places, the right support is unavailable. Jody Barney, one of the National Advisory Panel members for the project is a leading Aboriginal Disability consultant. She has assisted Aboriginal and Torres Strait Islander people with disabilities in the criminal justice system all over Australia. “While the project doesn’t focus on young people, we have identified the unmet needs of the young people with disabilities during the course of the project. The work needs to be extended to include youth and reduce the recidivism of young Aboriginal and Torres Strait Islander in detention.” she said. Another member of the advisory panel, Ms Elizabeth McEntyre, a criminal justice social worker has conducted research with Aboriginal communities in NSW and NT on Aboriginal people with mental and cognitive disabilities in the criminal justice system. ”Better education and information are needed for police, teachers, lawyers, magistrates, health, corrections, disability and community service providers regarding understanding and working with Aboriginal and Torres Strait Islander women and men with cognitive impairment and complex support needs, ” she said. 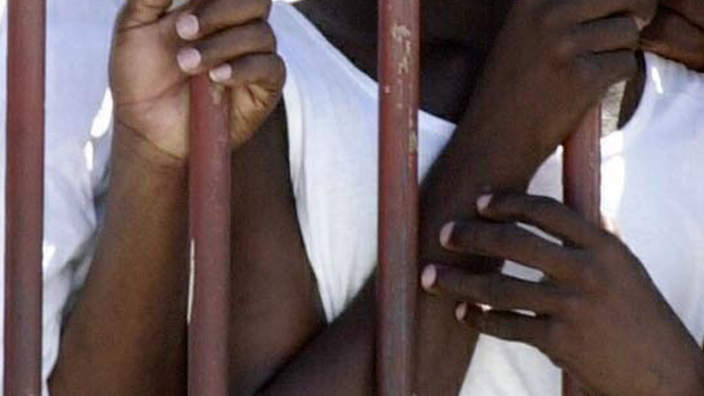 The researchers call for a suite of reforms to ensure accused persons with disabilities get the support they need to access justice on an equal basis with others. Mr Lenny Clarke, a First Persons Disability Network representative and one of the project’s advisors says that people with disabilities are often subject to prejudice, discrimination and exclusion. The project team recommends that it should be mandatory for all sections of Law enforcement agencies and administrators of the judicial system to participate in extensive training and awareness programs on disability. A major national inquiry into the over-imprisonment of Aboriginal and Torres Strait Islander peoples must focus on identifying tangible solutions that address the underlying causes of imprisonment, says the Change the Record (CTR) Coalition. In welcoming today’s announcement of an Australian Law Reform Commission (ALRC) inquiry into the over-imprisonment of Aboriginal and Torres Strait Islander people, the coalition of peak Aboriginal and Torres Strait Islander, human rights and legal organisations has said it is essential that the inquiry focus on practical measures that invest in and strengthen communities. 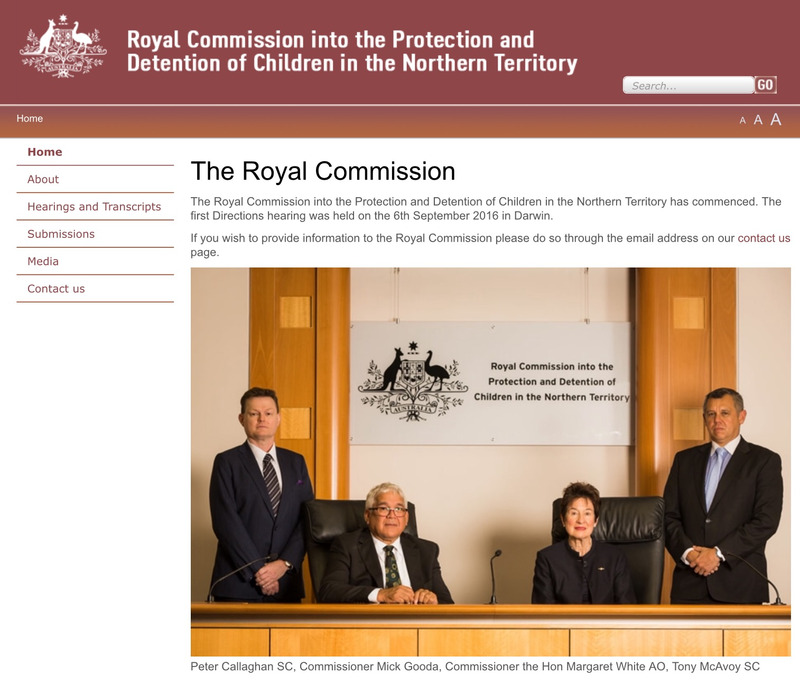 “This year marks 25 years since the landmark Royal Commission into Aboriginal Deaths in Custody (RCIADIC), but our people continue to experience imprisonment and violence at crisis rates. The new ALRC inquiry offers an important opportunity to shine a comprehensive light on these issues at a national level, and identify tangible actions for all levels of government” said Mr Duffy. At the time the RCIADIC report was handed down Aboriginal and Torres Strait Islander people were seven times more likely to be in prison, now in 2016 that figure has risen to 13 times. At the same time Aboriginal and Torres Strait Islander women are experiencing high rates of violence, being 34 times more likely to be hospitalised for family violence related assault. 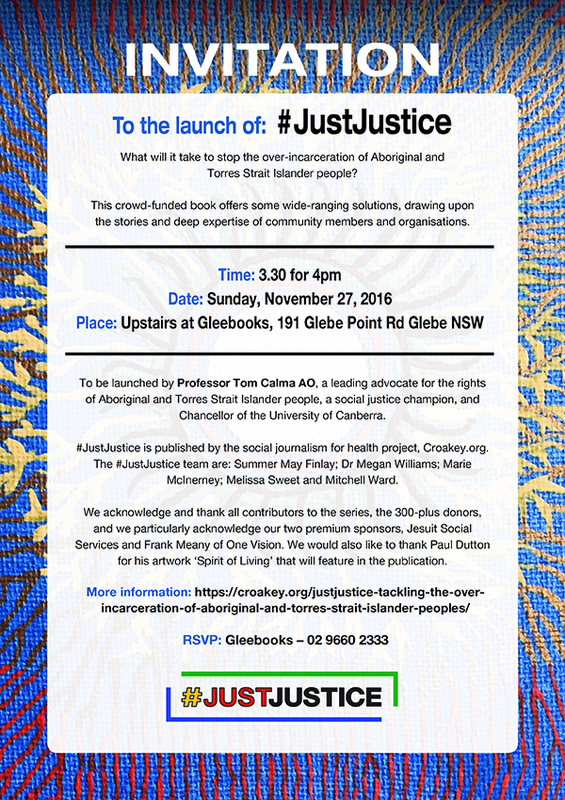 “The Federal Government should also take immediate steps to highlight its commitment to improving justice outcomes for Aboriginal and Torres Strait Islander peoples, including by setting meaningful national justice targets through the Council of Australian Governments (COAG) and committing to review the implementation of RCIADIC” said Ms Braybrook.